Searching for some of the best golf and water views in beautiful St. James Plantation? Look no further, this home is ALL about the view! 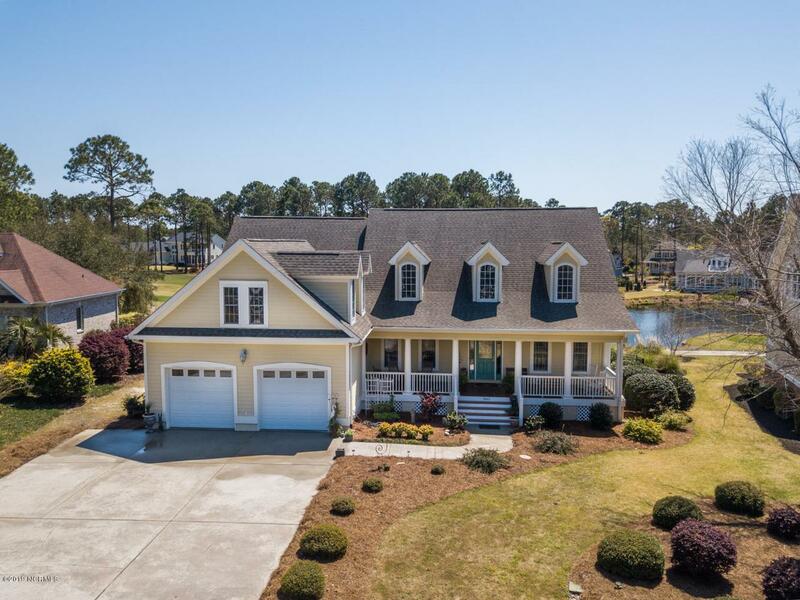 This outstanding home located on the 9th fairway of the Players Club golf course features two, four season sunrooms, a deck and hot tub to take advantage of the 180 degree views from a high vantage point. Excellent price/sqft value for this lovely, low country 4237 sq. ft, 4 bedroom 3 bath home. A large southern front porch welcomes you home to a grand two story great room, formal dining room & kitchen with 5 burner gas stove, two ovens, granite countertops and plenty of cabinet space. First floor master with two additional guest rooms on the main level. Huge upstairs with bedroom, bonus room and with additional kitchenette & family room.This home is close to the Regency and main St. James Gates and has an active St. James membership. Hardwood flooring in main living areas, gas fireplace and custom shelving. There is an abundance of storage space and concrete walk-in storage under the house. Why build, when you can start enjoying all that St. James has to offer! St. James amenities include 81 holes of Championship Golf. 4 distinct clubhouses. Indoor and outdoor pools, tennis, and fitness centers with full class offerings. 36+ miles of biking/walking trails. Fish, boat, and kayak on the Intracoastal Waterway. St. James Marina with wet slips/dry stacks, Tommy Thompson's Grille and Tiki Bar. Private beach club with spectacular views, private parking, showers and picnic area. Numerous community clubs and events. Friendly neighborhood with so much to do! If you are looking for the lifestyle you have always dreamed of, look no further! Listing provided courtesy of Lisa M Nieves of St James Properties Llc.